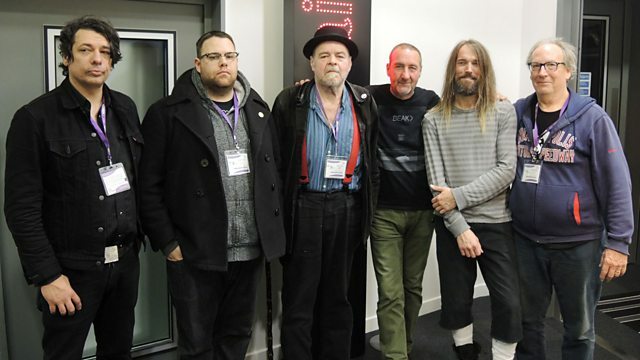 Marc has a live session from 1970s band Rocket from the Tombs, featuring members of the Dead Boys and Pere Ubu. Rocket From The Tombs in for us this evening. The band burned briefly and brightly in the mid-Seventies and with just a handful of tunes - among them the classic Sonic Reducer helped give shape to the punk movement that followed. After disbanding, members of RFTT went on to form the equally influential Dead Boys and punk's foremost weirdos, Pere Ubu. Exhumed in 2003, the return of Rocket From The Tombs has shown that although punk may or may not be dead, it came from the Tombs in the first place. Band is Crocus Behemoth (vocals), Gary Siperko (guitar, vocals), Buddy Akita (guitar), Craig Bell (bass, vocals) and Steve Mehlman (drums, vocals). The new album Black Record is out this week - this show is actually produced believe it or not. 1-2-3-4! Punk & New Wave 1976-1979.